Add POF Sun, Weather, and Graffiti Protection! 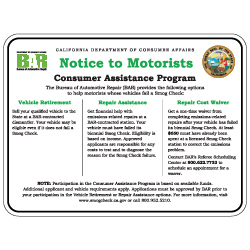 Required by the state of California, this Notice to Consumers sign meets the standards of the California Code of Regulations (CCR), Section 3340.22.2. This sign is also known as the Smog Check Station Repair Cost Limit Sign.